What is the Irish Prostate Cancer Outcomes Research study? Who is funding and carrying out this research? Where did you get my contact details? What is Clinical Research Development Ireland? What is the National Cancer Registry Ireland (NCRI)? What is the Clinical Research Facility in Galway? I don’t think I had a diagnosis of prostate cancer, why did you contact me? Why have I not been invited to join the study? Which hospitals is the study collecting data from? Why did my letter come from a different hospital than the one my urologist/oncologist etc, is based in? Do I have to fill in the questionnaire myself? Do I have to sign the consent form myself? Can I use a shortened version of my name or nickname to sign the consent form? Can I tell people I know that I’m taking part in the study? Do I have to visit a clinic to take part in the study? Where will the data you collect be stored? How will you keep my data safe? I don’t want to take part in the study or be contacted again, what do I do? I previously took part in the study but now no longer want to take part, what do I do? Where can I find results of the study? Why was I not offered a particular treatment (e.g. active surveillance, radiotherapy, hormone therapy)? Where can I get a device/help for erectile problems, or information about other support, medications or treatments? How do I fill in the online questionnaire? What is the TrueNTH Global Registry? I don’t have any symptoms, can I still participate in the study? I am not receiving any treatment for my prostate cancer, can I still participate in the study? Is this research project ethically approved? I’ve just received my pack and I think something might be missing. I have lost the pre-paid envelope, where can I send my completed consent form and questionnaire to? 1. What is the Irish Prostate Cancer Outcomes Research study? The Irish Prostate Cancer Outcomes Research (IPCOR) study is a collaborative research study that is establishing a registry of men with prostate cancer and collecting men’s experiences of care and the effects of their disease and the treatments on their quality of life. This information will be analysed to provide recommendations to doctors, hospitals and policy makers to improve prostate cancer care and to provide the supports that men need. 2. Who is funding and carrying out this research? The study is funded by the Movember Foundation, an international prostate cancer charity, supported by the Irish Cancer Society. The research is being carried out by a collaborative research partnership of Clinical Research Development Ireland (www.crdi.ie), National Cancer Registry Ireland (www.ncri.ie) and Clinical Research Facility in Galway (www.crfg.ie) at the National University of Ireland, Galway. The study is led by the Principal Investigator, Mr David Galvin – Consultant Urologist and co-investigators, Prof Ray McDermott – Medical Oncologist, Prof Frank Sullivan – Radiation Oncologist, Prof Linda Sharp – Population Health Scientist and Dr Conan Donnelly, NCRI. 3. Where did you get my contact details? Your contact details have been obtained by the National Cancer Registry Ireland from your hospital records which indicate that you have been diagnosed with prostate cancer. 4. What is Clinical Research Development Ireland? Clinical Research Development Ireland (CRDI) is a not-for-profit research partnership comprising NUI Galway, Royal College of Surgeons in Ireland, Trinity College Dublin, University College Cork, University College Limerick and University College Dublin, their medical schools, associated academic hospitals and clinical research facilities, with the objective of accelerating the translation of biomedical research into improved diagnostics, therapies and devices for patients. You can find out more about CRDI at www.crdi.ie. 5. What is the National Cancer Registry Ireland (NCRI)? The National Cancer Registry Board was established by the Minister for Health in 1991 by Statutory Instrument and is wholly funded by the Department of Health. It was set up to record information on all cancer cases occurring in Ireland and has been collecting such data since 1994. If you would like to find out more please visit the National Cancer Registry Ireland’s website www.ncri.ie. 6. What is the Clinical Research Facility in Galway? 7. I don’t think I had a diagnosis of prostate cancer, why did you contact me? If you believe that we have contacted you in error, please contact your Urologist or GP. 8. Why have I not been invited to join the study? We are inviting men who have been newly diagnosed with prostate cancer since July 2016 to take part in the study. At the moment we are inviting men to participate who attend one of the current IPCOR hospitals (The IPCOR hospitals are listed in the answer to question 9). We hope as the study continues we will be in a position to invite all men to the study but our current methods mean that approximately 80% of newly diagnosed men are invited to take part. If you were diagnosed with prostate cancer in one of the hospitals listed below in the answer to question 9 after July 2016 but did not receive an invite to participate in the study, please contact us by phoning a research officer at the National Cancer Registry Ireland on 087 361 9979. 9. Which hospitals is the study collecting data from? 10. Why did my letter come from a different hospital than the one my urologist/oncologist etc, is based in? You may have seen doctors or had treatment in various hospitals. We endeavour to only send one invite to take part in the study and so the letter will come from one of the hospitals you’ve visited. It may not be the one you visit most often. 11. Do I have to answer all the questions? No. We understand some questions are sensitive and you might not want to answer. You can skip these but please answer the rest of questions. Please remember that all your answers are confidential and will not be shared with anyone and will be pooled with other men’s answers so you will never be identified. The answers to these questions will help us to understand how to best support men in the future. 12. Do I have to fill in the questionnaire myself? No, you can have a friend or family member help you to fill in the questionnaire. However, it is your answers we are interested in so please tell the person your answers to each question. 13. Do I have to sign the consent form myself? Yes, we need you, the man invited to the study, to sign the consent form to show that you understand and give permission for your data to be used. 14. Can I use a shortened version of my name or nickname to sign the consent form? The signed name on the consent form needs to match the name on your invite letter. This is to avoid confusion when recording your consent to take part in the study. 15. Can I tell people I know that I’m taking part in the study? 16. How often will you contact me? We plan to contact you once a year to ask you to fill in the questionnaire. If you consent to being contacted about participating in future research, you may be contacted at other times but no more than twice a year. 17. Do I have to visit a clinic to take part in the study? No, for this study we just want you to fill in the questionnaire which you can do at home. 18. Where will the data you collect be stored? We are very careful with the data we collect and follow strict rules about how we look after it and who can use it. It is all kept strictly confidential and is only available to appropriate staff. All the information we collect will be password protected and encrypted and stored securely at the NCRI, CRFG and CRDI. All data exchanged wil be encrypted and transferred securely. Every effort will be made to keep your identity completely safe at all times. Reports that we publish will never identify any particular person, doctor or hospital. 19. How will you keep my data safe? We store the information we receive on computers in a safe place with secure passwords. It is all kept strictly confidential and is only available to appropriate staff. All the information we collect is password protected and encrypted. Every effort is made to keep your identity completely safe at all times. Reports that we publish will never identify any particular person, doctor or hospital. 20. I don’t want to take part in the study or be contacted again, what do I do? You can return the enclosed “No Further Contact” form to us in the pre-paid envelope provided or you can post it to PO Box 852, South City Delivery Office, Togher, Cork and we will not contact you again. Alternatively, you can contact an IPCOR research officer on 087 361 9979 to let us know that you do not want to take part in the study. 21. I previously took part in the study but now no longer want to take part, what do I do? If you previously participated in this study but now wish to withdraw from the study, please return the enclosed “No Further Contact” form to us in the pre-paid envelope provided or you can post it to PO Box 852, South City Delivery Office, Togher, Cork and we will not contact you again. Alternatively, you can contact an IPCOR research officer on 087 361 9979. The research officer will take a note of your IPCOR ID Number which you will find at the top of your invite letter. No further contact- we would no longer send you questionnaires, but would still have your permission to retain and use information and biological specimens that I have provided so far. No further use- we would no longer contact you in the future, and data from questionnaires that you submitted previously and your biological specimens would no longer be included in the research. If you change your mind after a long period of time, data from questionnaires and your biological specimens may have already been used. It is not possible for us to recall information and specimens from researchers once they have been used. 22. Where can I find results of the study? Results of the study will be published in reports on our website, www.ipcor.ie. Please note that research studies such as this take a long time to collect, analyse and publish the data. Our reports will show summary data only, no patient, doctor or hospital will be identified in these reports. 23. Why was I not offered a particular treatment (e.g. active surveillance, radiotherapy, hormone therapy)? Any questions regarding your cancer or medical care should be directed to your Urologist or GP (doctor). 24. Where can I get a device/help for erectile problems, or information about other support, medications or treatments? Any questions regarding your cancer or medical care should be directed to your Urologist or GP (doctor). If you would like to find out more about the support services available to you through the Irish Cancer Society, please visit www.cancer.ie/support. 25. How do I fill in the online questionnaire? 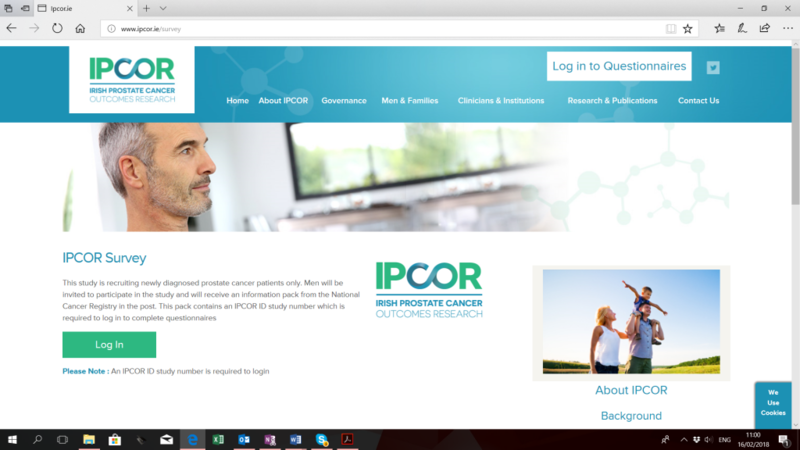 Firstly, please go to our website www.ipcor.ie and click the ”log in to questionnaires” button at the top right hand corner of the home page highlighted in the red box below. You are now brought to the IPCOR questionnaire page on our website, please click on the green “Log in“ button highlighted by the red box. You have now been brought to the log in section of the IPCOR questionnaire. You will see that you are on a patientMpower webpage. 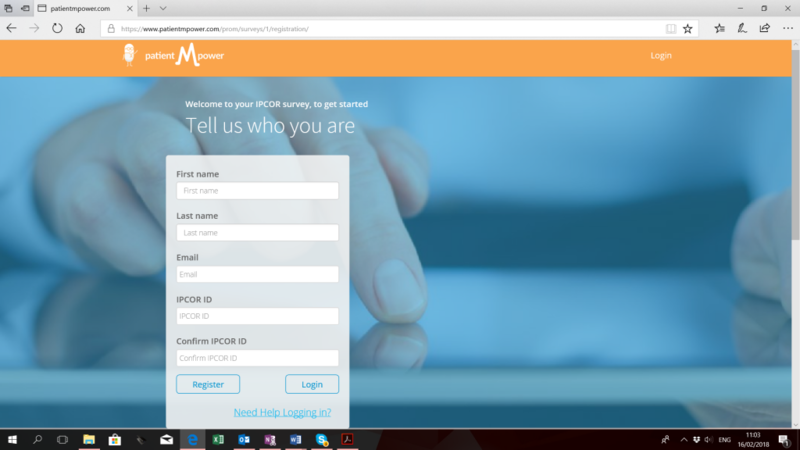 patientMpower developed the online questionnaire on behalf of the IPCOR study. You can find out more about patientMpower in the answer to the question “Who is patientMpower?” in the FAQ document. To log in please enter your name, email address and IPCOR ID number which you will find at the top right hand corner of your invite letter, then click register if this is your first time to log in or click log in if you have previously registered. If you are having trouble logging in, please click on the link “Need help logging in?” under the “Register” and “Login” buttons. If this is your first time logging in to fill in the questionnaire you will be brought to the consent page. The consent page asks you to consent to completing the questionnaires and the use of your biological specimens in future ethically approved research. You may also be asked for your consent to send your de-identified data to the TrueNTH Global Registry, if this is applicable. Please read through this information carefully and if you would like to proceed please click “I agree” at the bottom of the page and then next. If this is your first time logging in and you have completed the consent forms, you will be brought to the first page of the questionnaire. If you have previously logged in and consented to participate in the study, you will be brought directly to the questionnaire when you log in. Please answer the questions honestly. At the end of each page please click “Next” to go to the next page of questions, on the last page please click “Submit” to submit your answers to the IPCOR study. Thank you for taking part in the IPCOR study. patientMpower is a software development company who are committed to helping patients improve their outcome and providing better data to enable health providers measure outcomes and move towards value based healthcare. 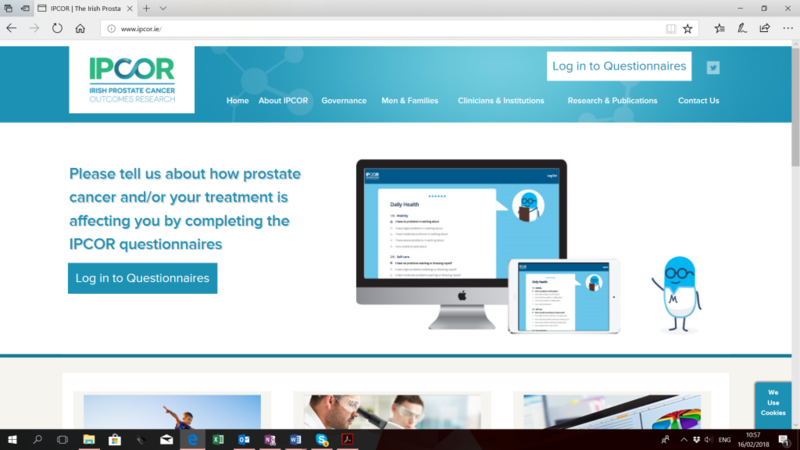 patientMpower have developed the online questionnaire for the IPCOR study and have also developed an app for prostate cancer patients which is available on our website. Data from the online questionnaire and the app is stored in a PostgreSQL database hosted in Google Compute Engine which has stringent security protocols. 27. What is the TrueNTH Global Registry? The TrueNTH Global Registry is an international registry which monitors prostate cancer care and aims to significantly improve the physical and mental health of men treated for prostate cancer. The registry will measure clinical and patient-reported outcomes and investigate current care practices in 13 countries around the world. The registry will identify which practices lead to the best outcomes for men with prostate cancer. The TrueNTH Global Registry is based in Monash University, Melbourne, Australia. Only de-identified data will be transferred to the TrueNTH Global Registry and will be encrypted in transit using SSL. The registry is held within a secure area of Monash University’s data centre. The data is used for research purposes only and no person, doctor or hospital will ever be identified in any report that is published. This article provides more information about the TrueNTH Global Registry http://bmjopen.bmj.com/content/7/11/e017006. If you have not attended one of these hospitals your data will not be shared with the TrueNTH Global Registry but will still be included in the IPCOR study and your participation will still contribute valuable information to the Irish national prostate cancer registry. 28. My address has changed, what should I do? Please let us know if your address has changed by contacting an IPCOR research officer on 087 361 9979. If possible, please quote your IPCOR ID number. 29. I don’t have any symptoms, can I still participate in the study? Yes, if you have a diagnosis of prostate cancer after February 2016, including Gleason 6 (3+3) disease, and have been invited to participate in the study, you are eligible to take part. 30. I am not receiving any treatment for my prostate cancer, can I still participate in the study? Yes, if you have a diagnosis of prostate cancer and have been invited to participate in the study, you are eligible to take part. 31. Is this research project ethically approved? This study is approved by the Research Ethics Committees governing each of the IPCOR hospitals. 32. I’ve just received my pack and I think something might be missing. You should have received an invite letter, the participant information leaflet, a consent form, a questionnaire, a no further contact form and a pre-paid envelope. If you think anything is missing, please contact an IPCOR research officer on 087 361 9979. 33. I have lost the pre-paid envelope, where can I send my completed consent form and questionnaire to? You can post the consent form and questionnaire to PO Box 852, South City Delivery Office, Togher, Cork. 34. Who can I contact about the study? If you have any queries about the study, please contact an IPCOR research officer on 087 361 9979. If you have questions about your cancer or medical care, please talk to your Urologist or GP.